Craig Sargent's "The Last Ranger" series is winding down. The author, Jan Stacy, had succumbed to AIDS and by this point one would assume he was nearing death unfortunately. I love his writing style - quick, action-infused - and hated for this series to come to an end. 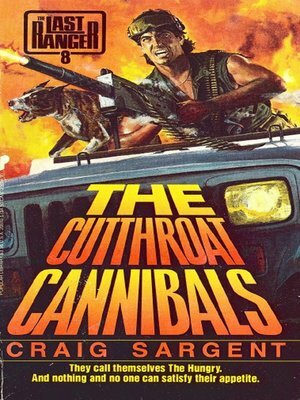 He finished it up with ten books total and this volume, "The Cutthroat Cannibals", marks entry number eight. It was released in 1988 via paperback publisher Popular Library. The premise of this one promises that our hero, Martin Stone, will face cannibal mongrels like a "Hills Have Eyes" or "Texas Chainsaw Massacre" horror theme. Unfortunately, the book's cannibals don't even appear until page 137 of the book's 170 pages. Disappointing for sure. Also, Stone doesn't even fire a weapon until the last ten pages. Shocking, right? After all, this whole series feeds our animal magnetism to cold, anonymous violence via firefights and blunt instrument terror. Nope. Shake all of that off. But what we get is a unique take on the character by the author that knows him so well. The first few pages has Stone and his dog Excalibur thrown into a landslide via a timely placed avalanche. This creates a savage broken leg for Stone, leaving our typical badass hero gimpy and weak. That's okay and gives us an added depth to the character. With the help of Excalibur the two find themselves stranded with no food, weapons or vehicle in the Colorado wilderness. In what would be perfect in "Cujo" or "Day of the Animals" is a pack of wild dogs that chase the two into a river that eventually washes the two up in a wild Native American tribe that worships a dog God. Yeah. Stone is left to fend for himself as Excalibur becomes "lost" in the forest. The tribe's chief plans to execute Stone but our hero comes up with a new plan - fight the Chief's son to death for the chance of freedom from the tribe. The two get it on and needless to say Stone, sporting no weapons and a broken leg, arrives the victor. The Chief lets Stone escape but it's a ruse. He plans to kill him after Stone's nap. Luckily, the Chief's son isn't a terrible loser and pays back Stone's gratitude of not killing him in battle to assist him with an escape. The two run from the tribe and eventually end up in another settlement near the end of the book. As promised - Cutthroat Cannibals are ready to dice up Stone for their version of Human Stew. Yummy. Needless to say this is a different book than what has become par for the course for the series. It was fun and entertaining to see Stone defenseless and relying on talking himself out of battle. The survival aspect is way high and the action, while few and far between, is just enough to keep it interesting. Per the prior seven books, there is a love interest that appears near the very end. Fitting that Stone gets nailed right before getting nailed. This guy's luck has to run out soon, right?